Ninjas carried secrets using "amigasa"
Amigasa (編み笠) was also one of the 6 necessary articles of ninjas. Amigasa is a braided hat made of rushes, sedges and straw. Of course amigasa was not necessarily a tool only for ninjas, in Japan in those days, many travelers wore them on their heads as a way of shielding themselves from the sun. There are some reasons why ninjas used them regularly. Firstly, they wore them to provide the shade. The history of Amigasa is really deep. 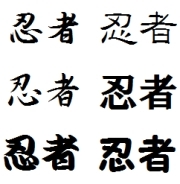 We can find descriptions about amigasa in the oldest Japanese writing " Nihon-Shoki (日本書紀) " written in the 8th century. 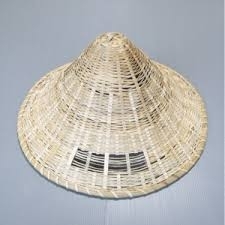 Not only in Japan, there had been a custom having amigasa on one's head in China and South East Asia so, it can be said that amigasa was quite a ubiquitous tool in Asia. The second reason why ninjas liked amigasa was that they could use them to bring some secrets in the amigasa. The size of an amigasa is so wide that ninjas can attach secret confidential documents or some kinds of weapons like short arrows or short swords in it. 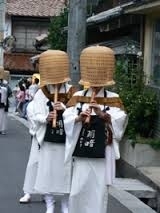 Further to this, ninjas could conceal their faces by means of putting an amigasa on over their head quite deeply. No one would think anything of traveler wearing an amigasa, regardless of how they wore it. After all, ninjas often disguised themselves as " komuso (虚無僧) " and amigasa was inseparable from komuso. Komuso were monks who were half-layman and did not get his head shaved. As komusos always wore an amigasa on their head, ninjas disgusted as komusos needn’t remove an amigasa from their head even if someone doubted their true characters. In addition to this, ninjas could get close to their targets or go anywhere they hoped by disguising themselves as komusos with amigasa. Because generally speaking, people are not cautious around monks amigasa was a really suitable hat for ninjas.